A Risograph is the alternative, well-known name for the RISO Duplicator, a high-speed digital printing system manufactured in Japan for high-volume, high speed printing. 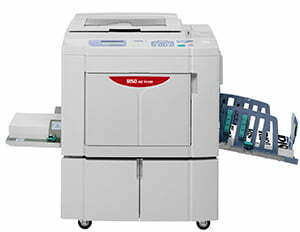 When printing many copies of the same document (generally more than 20), it is far cheaper to print on these printers than a conventional printer or photocopier. The Risograph is a mix between your standard office copier and a small offset printing press, giving you the best of both worlds; a combination of functionality but more importantly you can do large print runs at minimum cost to your organisation. As well as RISO duplicators, Midshire also provides a full range of RISO UK consumables, including all inks, drums, masters, spares and accessories. These devices are used for printing a large variety of printed materials including: posters, business cards, invitations, certificates, envelopes, catalogues, art prints and letterheads. A wide range of paper medias and weights can be printed on, from 46gsm up-to 400gsm. Risographs bridge the gap between in-house printing and lithographic printing. The ideal positioning for a this printer is print runs between 20 and up to 2,000 prints, after which it becomes more cost effective to use lithography and offset printing. They work by transferring artwork onto a master. The master is then wrapped around the colour drum, which is filled with ink. The paper which is flat, passes through the machine. The ink is pushed through the stencil and down onto the paper. You can use a number of colour drums interchangeably to create multi-coloured artwork. Duplicators can print up to A2, with the introduction of the new RISO A2 digital duplicator, but traditional ones can print up to A3 paper. Full-bleed printing is not possible, but can be achieved with a guillotine after the printing process. More advanced devices have finishing options including glue binding and stapling, so users can make magazines, with minimal user involvement in the process. 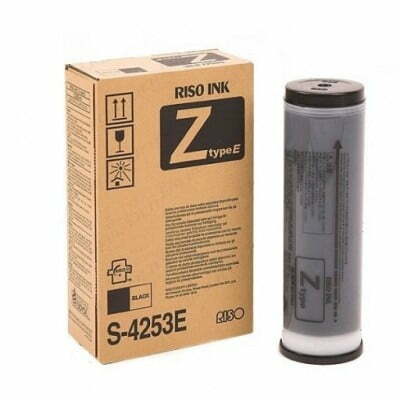 What coloured inks can Risographs use? There are 21 standard inks, though special order colours can be made to help organisations meet their corporate brand guidelines. The 21 standard colours include: black, blue, medium blue, red, green, fluorescent pink, fluorescent orange, purple, light grey and metallic gold. RISO ink is semi-transparent, providing the opportunity to overprint the colours, which can produce a wide spectrum of colours from just a couple of inks and can result in many artistic effects. What is the lifespan of a Risograph? Risographs are the workhorse of the office printers. A good lifespan of one of these devices may include making 100,000 masters and 5,000,000 copies. Because there is no heat involved in the printing process, they experience fewer jams, and need less maintenance than other office printers.